A giant choco lava cake tempted me to plunge into its sweetness. I ran towards it and then stopped and wondered what it was doing in the middle of Lalbagh Garden. 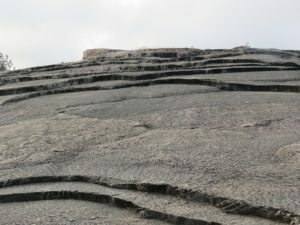 Then, I realized that it was a Peninsular Genesis Rock which was probably over 3,000 million years old. I had heard of the Rock of Ages but this was an ageless rock! This rock is one of the oldest in the world. I reluctantly walked down the solid waves of the rock and decided to explore a glass house which was only a little over a century old. Built in 1889, it hosts 2 flower shows in a year. The entire road leading up to the glass house is lined with tropical trees. 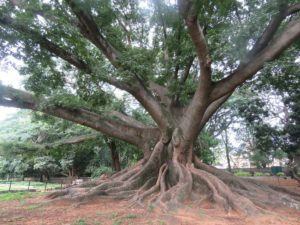 What stood out among these was a White Silk Cotton Tree, which spread its Arnold Schwarzenegger-like arms all around, creating a safe home for birds and a shade that invited me to have a nap. I felt like I was in my mother’s lap. The sturdy tree revealed its soft side by sprinkling cotton all around. There couldn’t be a greater example of how much trees care for all living beings. I was distracted by a familiar ‘kilch kilch kilch’. It was a small Blue Kingfisher celebrating his fishing feat of the day. His celebration was shared by countless ripples dancing across the greenish-blue lake. 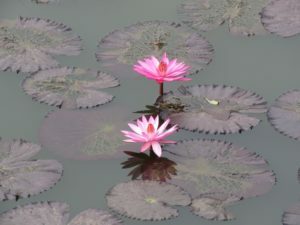 The pink water lilies watched on in amusement. A Brahminy Kite appreciated the kingfisher’s feat and waited for his prey. 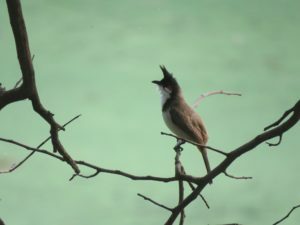 On the other side of the lake, a flock of Red Whiskered Bulbuls were playing hide-and-seek among beautiful pinkish-white Java Cassia blooms. I didn’t know whether to focus on the blossoms or the bulbuls. 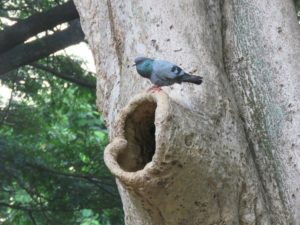 I turned my attention to a Rock Pigeon who had just stepped out of his hole-shaped PG room in a tree. 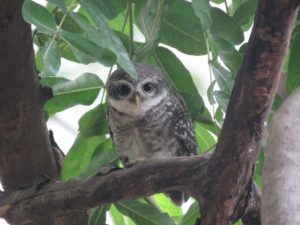 Then, I spotted a Spotted Owlet who seemed tired after his night shift. My eyes were glued to him, but my nostrils were distracted by the scent of a Lemon Gum Tree, the bark of which is used as an ingredient in insect repellents. 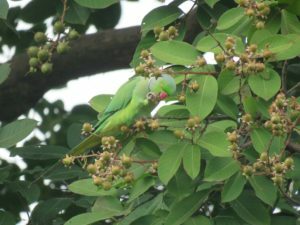 In the distance, a flock of Indian Ring-necked Parakeets were feasting on juicy fig fruits. 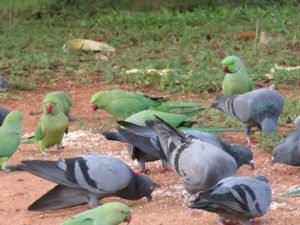 Another gang of parakeets were eating grains. Too bad, they missed the real delicacy. One who truly has the passion to explore new possibilities will enjoy the fruits of life. 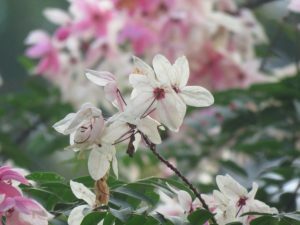 I pondered upon this, as I rested on a bench, inhaling the refreshing scent of frangipani. Its a delightght for the eyes to watch the story charectors and a symphony to hear the narration of the writer..A Treat must say. Wonderful to know so much in stock of nature out there..
Splendid. Beautifully narrated in detail. It’s really a great for some who loves nature . Bravo.